Android 5.0 is now available for Nexus device -- what's with the Lollipop? Google's latest mobile OS referred to as the Android 5.0 Lollipop is now officially made available to consumers. This happens as pre-orders for the new Nexus hardware initiates. "Lollipop" -- this sweet, playful name is somehow making it feel fresh and alive, but what really is the Lollipop's internal logic? According to Google's Nicholas Jitkoff, "design" is a major focus for Lollipop. And Touch is one of the primary elements of material design which is inspired by real life materials. Other than design, Lollipop has lots of new things to offer. Android Lollipop is promising a number of more enhanced and interesting features for Android device consumers, including a responsive, natural motion, realistic lightning and shadows, along with familiar visual elements that would make it easier for users to navigate their devices. It also offers new ways to control notifications (more intelligent ranking of notifications) for messages received like opting only to get interrupted when you want to be, as well as view or respond to messages directly from your lock screen. And with the Lollipop, you will no longer be interrupted with incoming phone calls especially when you're watching or playing videos or music. Additional 15 new languages are also made, making a total of more than 68 usable languages for users to choose from. All these and a whole lot more when you download and install this latest Android mobile OS on your device. How to get your share of Android Lollipop on your device? So far, Google will purportedly roll out OTA (over-the-air) updates to certain devices including the Nexus 4, Nexus 5, as well as for Nexus 7 and Nexus 10 tablets. All you need is to go into the About Phone menu in the Settings app and check your Nexus device for the available update. Generally, you will find the option to upgrade to Lollipop under a menu labeled "Software Updates." Relevant reports however said that you only get one opportunity per day to get an update. This means that if you don't get it on your first day, then you'll have no chance of getting it until the next day. 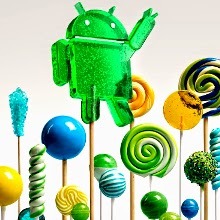 Android Lollipop or Android L, was officially announced on October 15 this year. It is deemed one of the biggest upgrades to Android yet, offering new radical design, 5000 new APIs along with a number of whole new features and functions, with the entire interface updated and improved. It's available for free but some handsets will take longer to get it than others. What devices are eligible for this update? Aside from Nexus, Android Lollipop will also be hitting the HTC One (M8), HTC One (M7), Motorola Moto X and OnePlus One devices within three months of Google releasing a final build. Samsung, on the other hand is yet to officially utter its final statement as to when it will be rolling Android Lollipop out to its phones. Nevertheless, some sources said it will be sooner than later. The Samsung Galaxy S5 could likely get the update in December of this year while the Galaxy Note 4, Galaxy Alpha and Galaxy Note 3 will possibly be updated quickly. Sony has openly announced that it will be bringing Android 5.0 Lollipop to the entire Xperia Z Series including Xperia Z, Xperia ZL, Xperia ZR, Xperia Tablet Z, Xperia Z1, Xperia Z1S, Xperia Z Ultra, Xperia Z1 Compact, Xperia Z2, Xperia Z2 Tablet, Xperia Z3, Xperia Z3v, Xperia Z3 Compact and Xperia Z3 Tablet Compact. While the exact date for the update is yet to be revealed, Sony has said that they will be starting the upgrade "at the beginning of 2015 for the core Xperia Z3 and Xperia Z2 series – continuing thereafter for all remaining devices above."